Fall is the best time to overseed a lawn or repair thin or bare areas. The cool nights and mild, shorter days provide the ideal conditions for seed germination. Seed is better able to retain moisture in these conditions, and seedlings will thrive without the extreme heat that occurs in the summer months. Isn’t Spring Best for New Seed? It's fine to overseed in spring, but if you're like most people, you'll wait too long and find yourself in summer, when it's much more difficult to get new grass to grow. This is understandable; there's a lot going on spring—the lawn, the garden, outdoor projects, etc.—and overseeding can be a time-consuming task. Also, if you're in the habit of applying a crabgrass prevention herbicide, you can forget about spring seeding. Most pre-emergent herbicides inhibit all seed germination for up to 12 weeks. That puts you right in the middle of summer. Finally, it's best to overseed right after aerating the lawn, and the best time to do this is fall. A lawn that is never overseeded tends to grow old. If it is consistently mowed, it doesn’t even have the opportunity to go to seed to propagate itself. The lawn will have to rely on rhizomes, stolons and tillering for growth. Eventually, an old lawn will have trouble maintaining vigorous growth, competing with weeds and dealing with other lawn stresses. Also, new varieties of grass species are entering the market every year so it is beneficial to integrate grass that may be resistant to drought, disease or insect damage into a lawn with older varieties without these features. For cool-season turf, start the overseeding process by thoroughly aerating the lawn. Apply the new seed with a fertilizer spreader, following the product's recommended coverage rate. It's ideal when the seeds fall into the aeration holes because there they won't dry out as quickly and will germinate faster. You can even go over the lawn with the back side of a rake to usher more seeds into the holes. Follow the seeding with an application of your favorite fall fertilizer, applying it the same day as the seed, then water the lawn. Water once or twice every day until the new grass has begun to grow. The seed may need two weeks or more to germinate. Continue to mow the lawn as usual until it stops growing for the season. There is no need to mow the grass extra short with the last mowing. Be sure to use the appropriate type of grass seed for your climate, be it a cool season or warm season. Also choose the right type of seed for your lawn’s use, whether it’s high-use and intensely maintained or aesthetic and low-maintenance. Drought-resistant grasses are now available in both cool and warm season species. I also recommend not buying the cheapest seed you can find. Grass seed comes in a range of quality, and you get what you pay for. 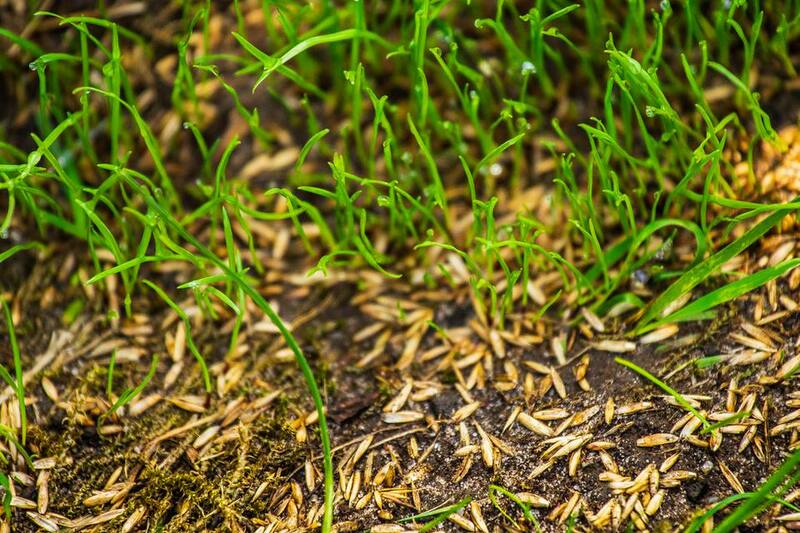 Often the cheap seed is made up of generic, poor-performing varieties of grass or, worse, loaded with filler like weed seeds or annual ryegrass. You don’t have to buy the most expensive variety out there, but look for something this is good quality and highly recommended by local experts.